Rag Dolls 39cm-41cm are available in a variety of very pretty dresses. So much attention to detail and a variety of lovely styles. 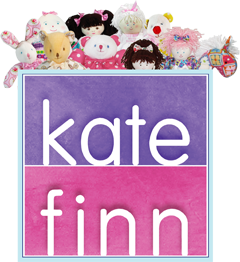 Rag Dolls 39cm-41cm are one of Kate Finn’s most popular categories! Make sure you check out Kate Finn’s series of short stories about The Finnies and treat your little ones to lot’s of fun watching Kate Finn’s Vimeo or YouTube Channel!